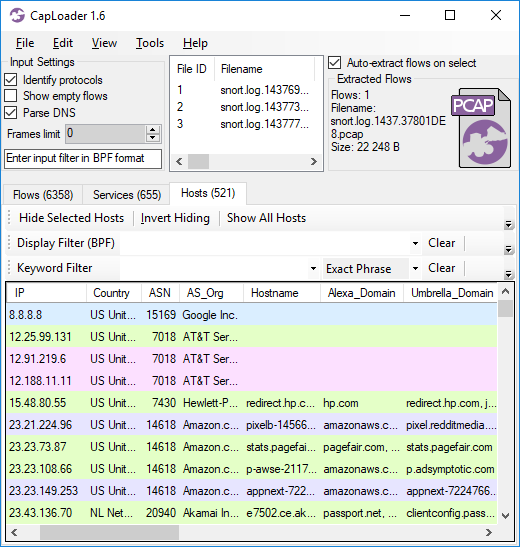 CapLoader is designed to simplify complex tasks, such as digging through gigabytes of PCAP data looking for traffic that sticks out or shouldn’t be there. 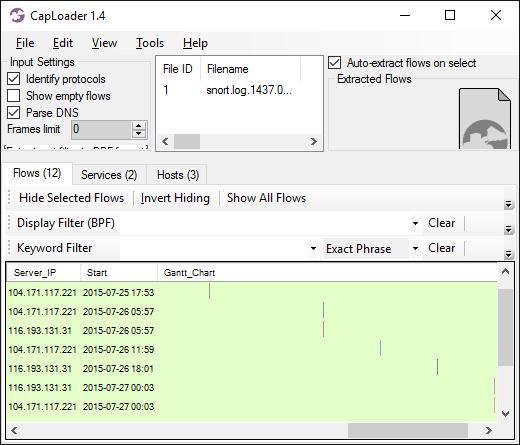 Improved usability has therefore been the primary goal, when developing CapLoader 1.6, in order to help our users do their work even more efficiently than before. 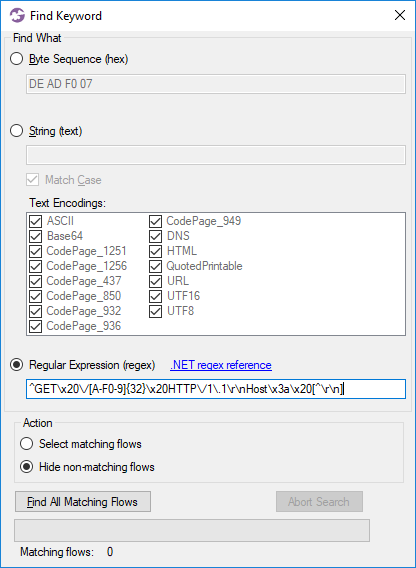 Context aware selection and filter suggestions when right-clicking a flow, session or host. 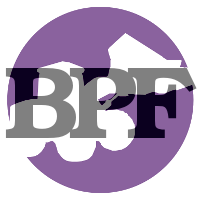 Support for IPv6 addresses in the BPF syntax for Input Filter as well as Display Filter. Flows that are inactive for more than 60 minutes are considered closed. This timeout is configurable in Tools > Settings. 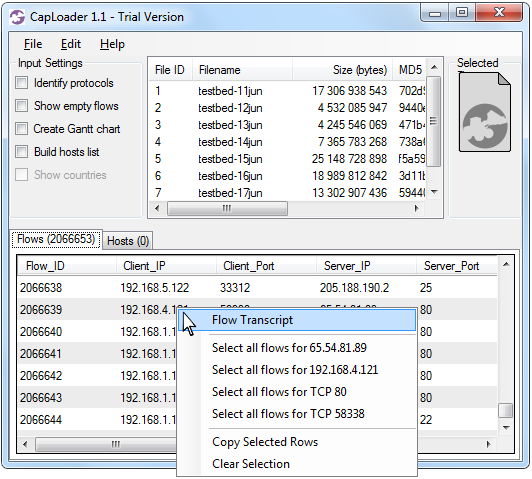 CapLoader 1.6 also introduces a new column in the Flows tab labeled “Initial_RTT”, which shows the Round Trip Time (RTT) measured during the start of a session. The RTT is defined as “the time it takes for a signal to be sent plus the time it takes for an acknowledgment of that signal to be received”. 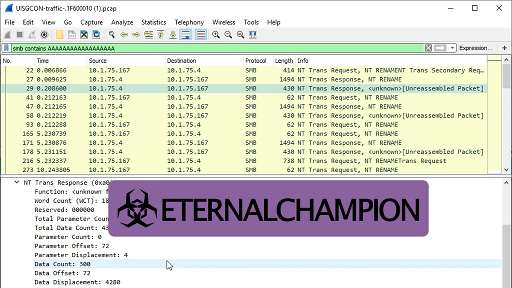 RTT is often called “ping time” because the ping utility computes the RTT by sending ICMP echo requests and measuring the delay until a reply is received. 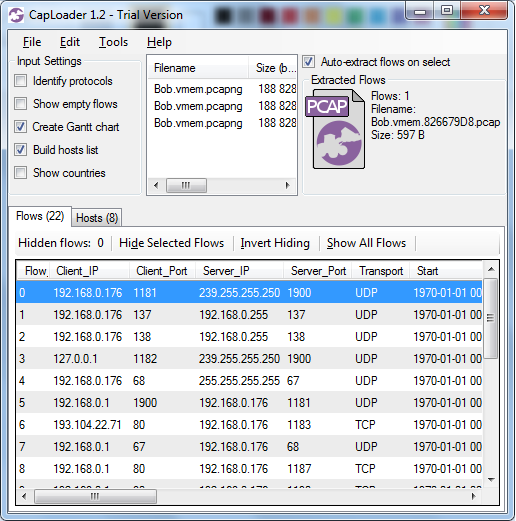 Image: CapLoader 1.6 showing ICMP and TCP round trip times. 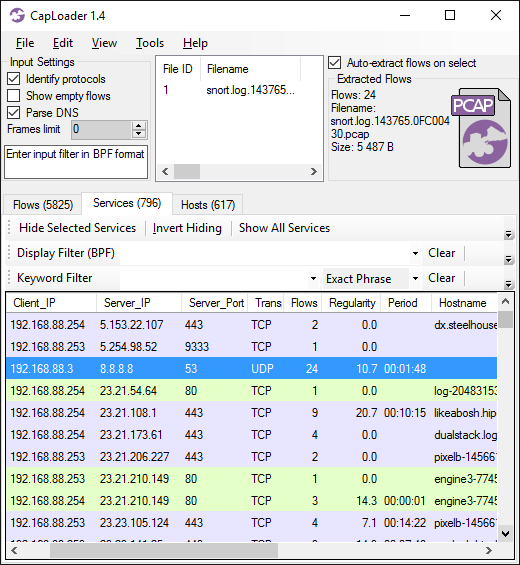 But using a PCAP file to measure the RTT between two hosts isn’t as straight forward as one might think. 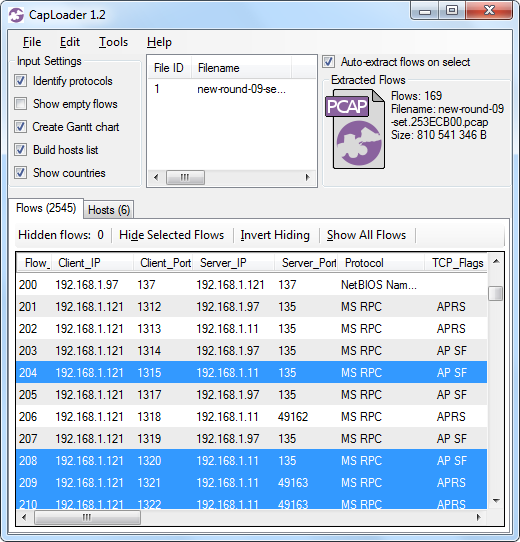 One complicating factor is that the PCAP might be generated by the client, server or by any device in between. If we know that the sniffing point is at the client then things are simple, because we can then use the delta-time between an ICMP echo request and the returning ICMP echo response as RTT. In lack of ping traffic the same thing can be achieved with TCP by measuring the time between a SYN and the returning SYN+ACK packet. 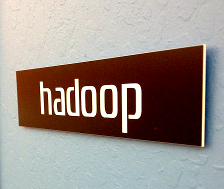 However, consider the situation when the sniffer is located somewhere between the client and server. 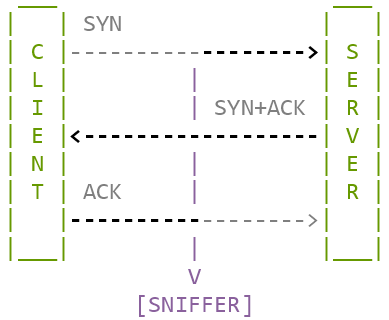 The previously mentioned method would then ignore the latency between the client and sniffer, the delta-time will therefore only show the RTT between the sniffer and the server. Image: Initial RTT is the total time of the black/bold packet traversal paths. 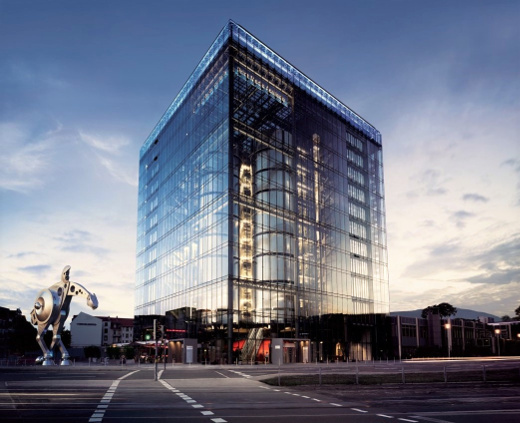 Jasper Bongertz does a great job of explaining why and how to use the iRTT in his blog post “Determining TCP Initial Round Trip Time”, so I will not cover it in any more detail here. However, keep in mind that iRTT can only be calculated this way for TCP sessions. 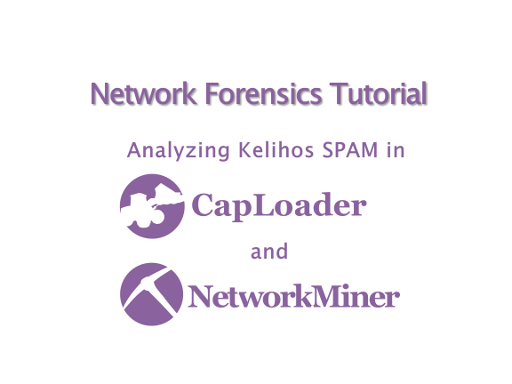 CapLoader therefore falls back on measuring the delta time between the first packet in each direction when it comes to transport protocols like UDP and ICMP. The new features mentioned so far are all available in the free 30 day CapLoader trial, which can be downloaded from our CapLoader product page (no registration required). But we’ve also added features that are only available in the commercial/professional edition of CapLoader. 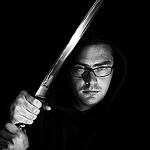 One such exclusive feature is the matching of hostnames against the Cisco Umbrella top 1 million domain list. CapLoader already had a feature for matching domain names against the Alexa top 1 million list, so the addition of the Umbrella list might seem redundant. But it’s actually not, the two lists are compiled using different data sources and therefore complement each other (see our blog post “Domain Whitelist Benchmark: Alexa vs Umbrella” for more details). Also, the Umbrella list contains subdomains (such as www.google.com, safebrowsing.google.com and accounts.google.com) while the Alexa list only contains main domains (like “google.com”). CapLoader can therefore do more fine-granular domain matching with the Umbrella list (requiring a full match of the Umbrella domain), while the Alexa list enables a more rough “catch ‘em all” approach (allowing *.google.com to be matched). 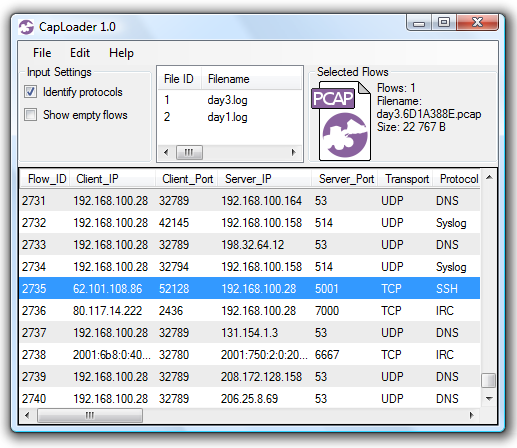 CapLoader 1.6 also comes with an ASN lookup feature, which presents the autonomous system number (ASN) and organization name for IPv4 and IPv6 addresses in a PCAP file (see image above). The ASN lookup is built using the GeoLite database created by MaxMind. 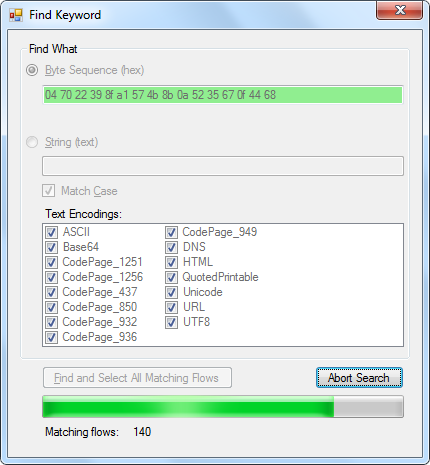 The information gained from the MaxMind ASN database is also used to provide intelligent display filter CIDR suggestions in the context menu that pops up when right-clicking a flow, service or host. 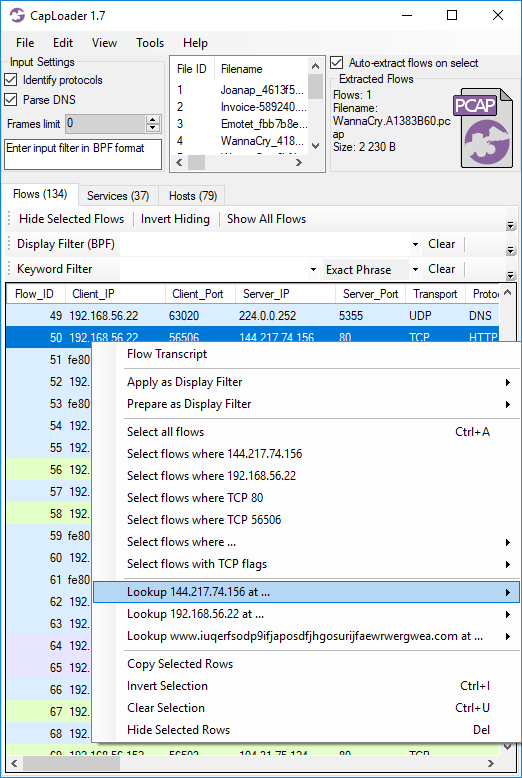 Image: Context menu suggests Display Filter BPF “net 104.84.152.0/17” based on the server IP in the right-clicked flow. Users who have previously purchased a license for CapLoader can download a free update to version 1.6 from our customer portal. 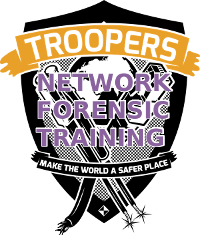 We’d like to thank Christian Reusch for suggesting the Initial RTT feature and Daan from the Dutch Ministry of Defence for suggesting the ASN lookup feature. 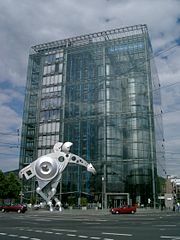 We’d also like to thank David Billa, Ran Tohar Braun and Stephen Bell for discovering and reporting bugs in CapLoader which now have been fixed. 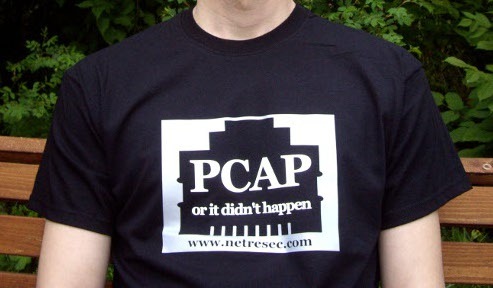 These three guys have received a “PCAP or it didn’t happen” t-shirt as promised in our Bug Bounty Program. 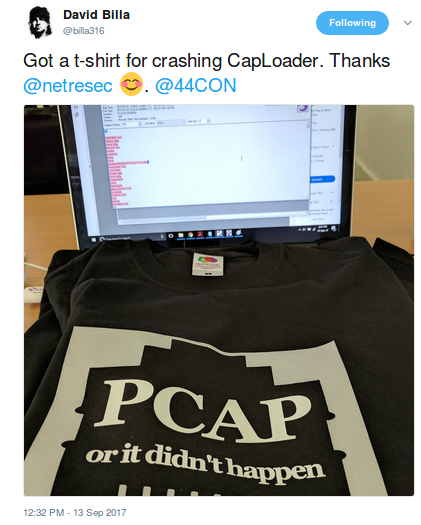 If you too wanna express your view of outlandish cyber attack claims without evidence, then please feel free to send us your bug reports and get rewarded with a “PCAP or it didn’t happen” t-shirt! 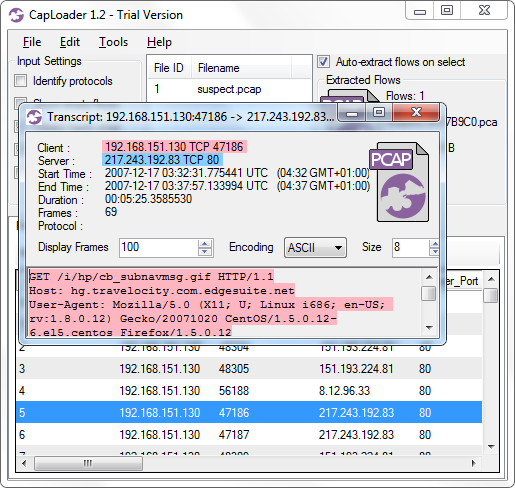 I am happy to announce a new release of our super-fast PCAP handling tool CapLoader! 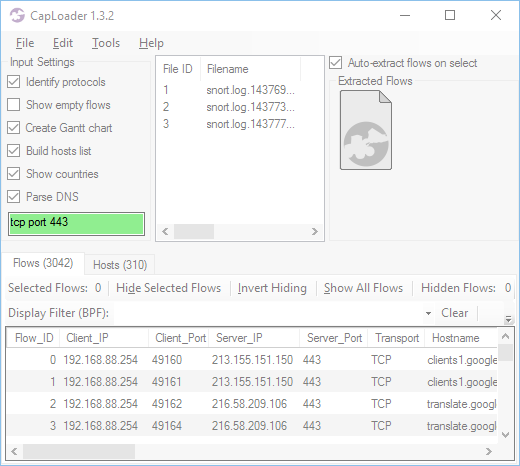 One of the new features in CapLoader makes it even easier to detect malicious network traffic without having to rely on blacklists, such as IDS signatures. 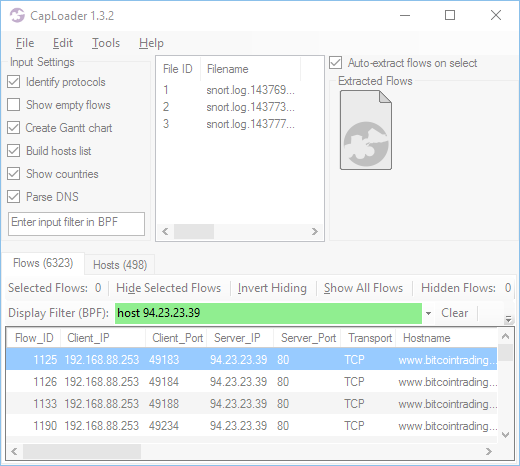 The biggest addition to version 1.4 of CapLoader is the Services tab, which presents a somewhat new way of aggregating the flows found in a PCAP file. 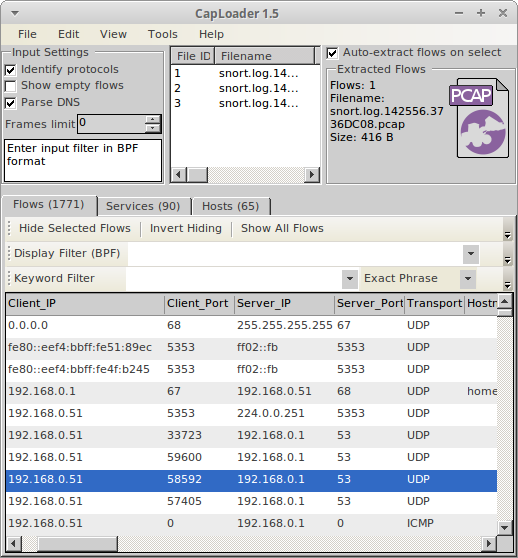 Each row (or “service”) in the services tab represents a unique combination of <Client-IP, Server-IP, Server-port and Transport-protocol>. This means that if a single host makes multiple DNS requests to 8.8.8.8, then all those flows will be merged together as one row in the services tab. 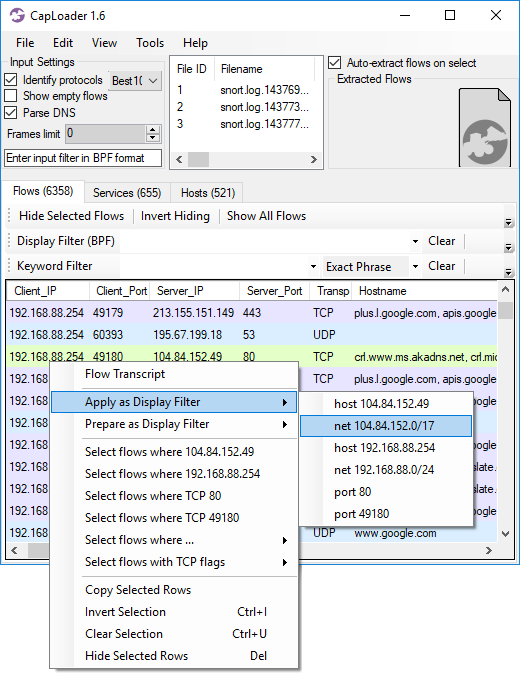 This view makes it easy to see if a host is frequently accessing a particular network service. 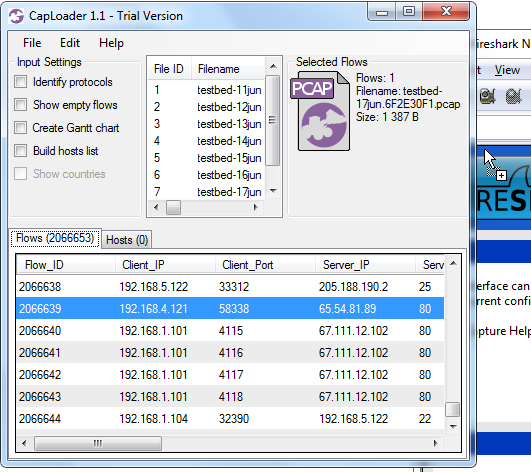 CapLoader even shows if the requests are made with regular intervals, in which case we measure the regularity and determine the most likely period between connections. The idea for measuring regularity comes from Sebastian Garcia's Stratosphere IPS, which can identify botnets by analyzing the periodicity of flows going to a C2 server. 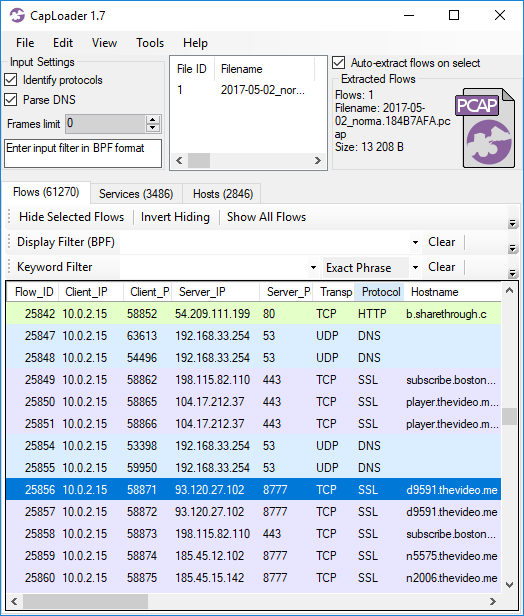 Here's what the Services tab looks like when loading 500 MB of PCAP files from a network where one of the hosts has been infected with malware (Win32/Kovter.B). As you can see in the flows tab, these services are accessed by the client on a regular interval of about 6h 2min. 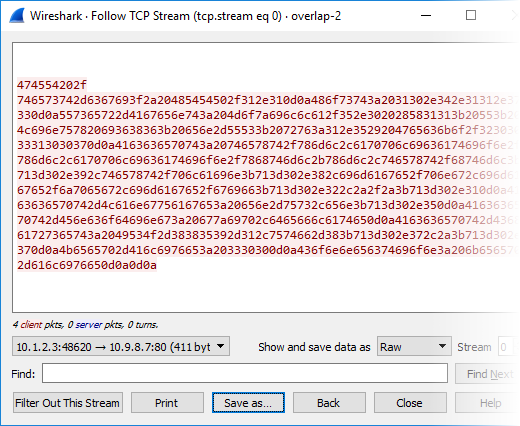 Doing a flow transcript of one such flow additionally reveals that the payload seems suspicious (not HTTP on TCP 80). Service #5 is a mail client connecting to the local POP3 server every 30 minutes. Service #6 is Microsoft-CryptoAPI updating its Certificate Revocation List from crl.microsoft.com every 5 hours. As shown in this blog post, analyzing the regularity of services is an efficient way of detecting C2 beacons without having to rely on IDS signatures. This method goes hand-in-hand with our Rinse-Repeat Intrusion Detection approach, which can be used to find malicous network traffic simply by ignoring traffic that seems “normal”. Delete key is no longer hijacked by the “Hide Selected Flows” button (Thanks to Dominik Andreansky for finding this bug). CapLoader GUI now looks okay even with graphics are scaled through "custom sizing". Thanks to Roland Wagner for finding this. 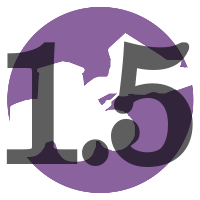 All paying customers with an older version of CapLoader can grab a free update to version 1.4 at our customer portal. We're happy to announce that it is now possible to detect Kovter's C2 communication with help of an IDS signature thanks to Edward Fjellskål. Edward shared his IDS signature "NT TROJAN Downloader/Malware/ClickFraud.Win32.Kovter Client CnC Traffic" on the Emerging-Sigs mailing list yesterday. We have worked with Edward on this and the signature has been verified on our Kovter C2 dataset. Edward Fjellskål's IDS signature "ET TROJAN Win32.Kovter Client CnC Traffic" has now been published as an Emerging Threats open rule with SID 2022861. I have previously blogged about packet injection attacks, such as the Chinese DDoS of GitHub and Covert Man-on-the-Side Attacks. However, this time I've decided to share some intelligence on real-world packet injection attacks that have been running for several months and that are still active today. It is known that some network operators inject false content into users’ network traffic. Yet all previous works that investigate this practice focus on edge ISPs (Internet Service Providers), namely, those that provide Internet access to end users. Edge ISPs that inject false content affect their customers only. However, in this work we show that not only edge ISPs may inject false content, but also core network operators. These operators can potentially alter the traffic of all Internet users who visit predetermined websites. We have attempted to recreate these packet injections by visiting the same URLs again. Unfortunately most of our attempts didn't generate any injected responses, but we did manage to trigger injections for two of the groups listed by Nakibly et al. (“hao” and “GPWA”). 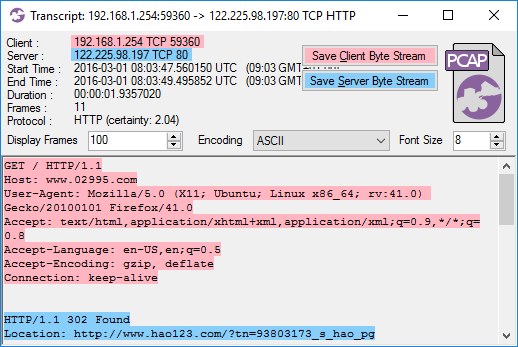 Judging from the IP Time-To-Live (TTL) values we assume that the first response (hao123.com) was an injected packet, while the second response (hao.360.cn) was coming from the real webserver for www.02995.com. If you have an eye for details, then you might notice that the injected packet doesn't use the standard CR-LF (0x0d 0x0a) line breaks in the HTTP response. The injected packet only uses LF (0x0a) as line feed in the HTTP header. That PCAP file was released after Yun Zheng Hu (of Fox-IT) gave a presentation titled “Detecting Quantum Insert” at BroCon 2015. A video recording of Yun Zheng's talk is available online, including a live demo of the packet injection. 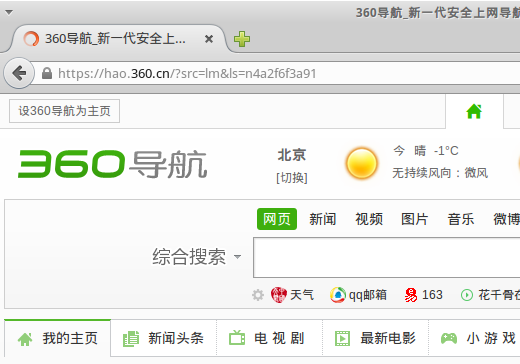 We have managed to re-trigger this packet injection attack as well, simply by visiting http://id1.cn. 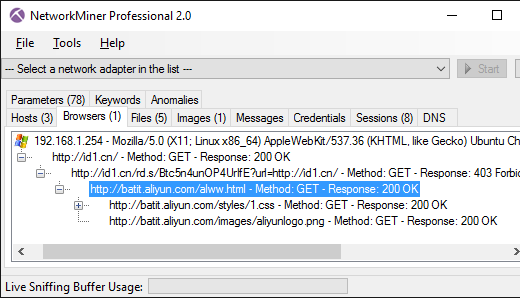 Doing so triggers two injected HTTP responses that attempts to do a redirect to http://batit.aliyun.com/alww.html. 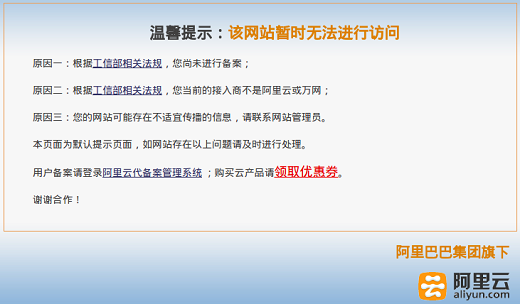 The target page of the injected responses has a message from the Alibaba Group (aliyun.com) saying that the page has been blocked. 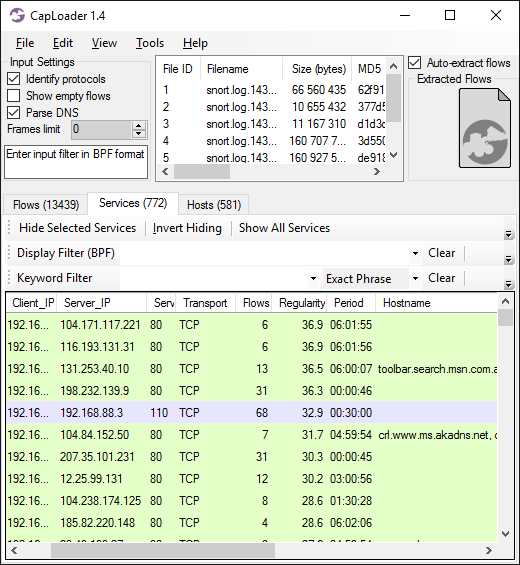 Frame 20 : The client also receives two injected packets trying to do a “403 Forbidden” that redirects to http://batit.aliyun.com/alww.html. However, these injected packets arrived too late. 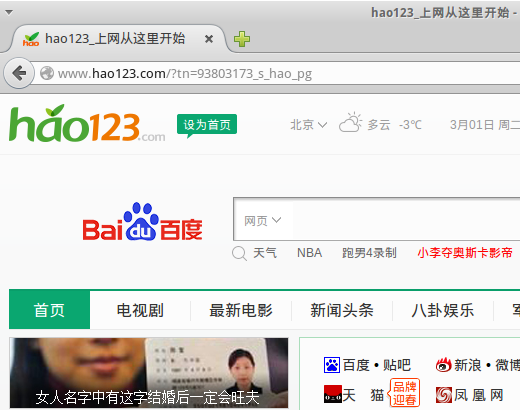 Frame 25 : Two new injected responses are sent, this time successfully redirecting the client to the Alibaba page. Frame 28 : The real response arrives too late. 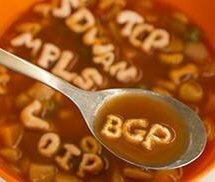 The best way to protect against TCP packet injection attacks is to use SSL encryption. Relying on HTTP websites to do a redirect to an HTTPS url isn't enough, since that redirect could be targeted by packet injection. So make sure to actually type “https://” (or use a browser plug-in) in order to avoid being affected by injected TCP packets. The anonymity network Tor is often misused by hackers and criminals in order to remotely control hacked computers. In this blog post we explain why Tor is so well suited for such malicious purposes, but also how incident responders can detect Tor traffic in their networks. The privacy network Tor (originally short for The Onion Router) is often used by activists and whistleblowers, who wish to preserve their anonymity online. Tor is also used by citizens of countries with censored Internet (like in China, Saudi Arabia and Belarus), in order to evade the online censorship and surveillance systems. Authorities in repressive regimes are therefore actively trying to detect and block Tor traffic, which makes research on Tor protocol detection a sensitive subject. What the Skynet botnet creator realized, is that he could build a much stronger infrastructure at no cost just by utilizing Tor as the internal communication protocol, and by using the Hidden Services functionality that Tor provides." The thsark output above looks no different from when a real HTTPS session is being analyzed. So in order to detect Tor traffic one will need to apply some sort of traffic classification or application identification. 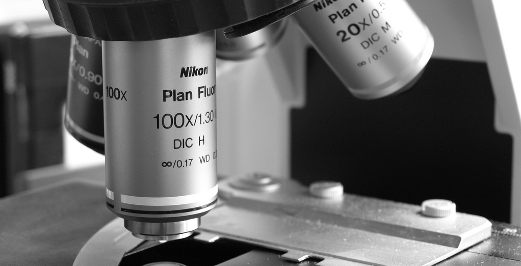 However, most implementations for protocol identification rely on either port number inspection or protocol specification validation. But Tor often communicate over TCP 443 and it also follows the TLS protocol spec (RFC 2246), because of this most products for intrusion detection and deep packet inspection actually fail at identifying Tor traffic. A successful method for detecting Tor traffic is to instead utilize statistical analysis of the communication protocol in order to tell different SSL implementations apart. 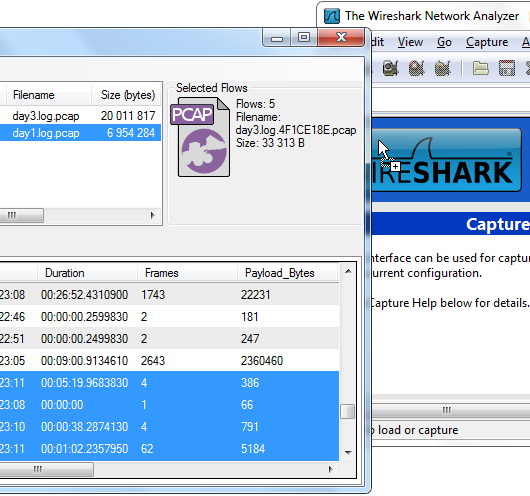 One of the very few tools that has support for protocol identification via statistical analysis is CapLoader. 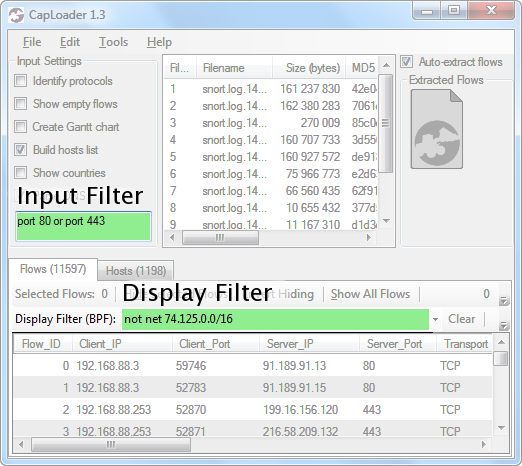 CapLoader provides the ability to differentiate between different types of SSL traffic without relying on port numbers. This means that Tor sessions can easily be identified in a network full of HTTPS traffic. @snowfl0w provides some nice analysis of the SkyNet botnet (a.k.a. 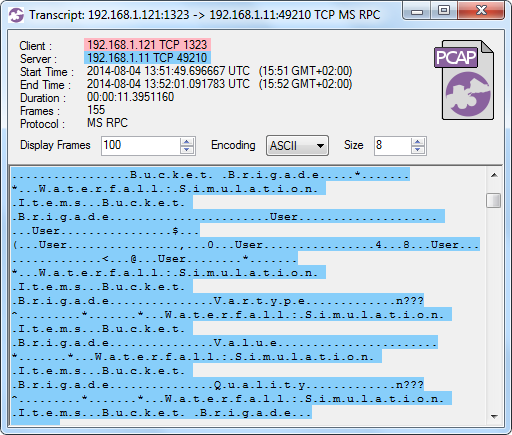 Trojan.Tbot) at the Contagio malware dump, where she also provides PCAP files with the network traffic generated by the botnet. Unfortunately the file “tbot_A055[...]” only contains outgoing network traffic. This was likely caused by an incorrect sniffer setup, such as a misconfigured switch monitor port (aka SPAN port) or failure to capture the traffic from both monitor ports on a non-aggregating network tap (we recommend using aggregation taps in order to avoid these types of problems, see our sniffing tutorial for more details). 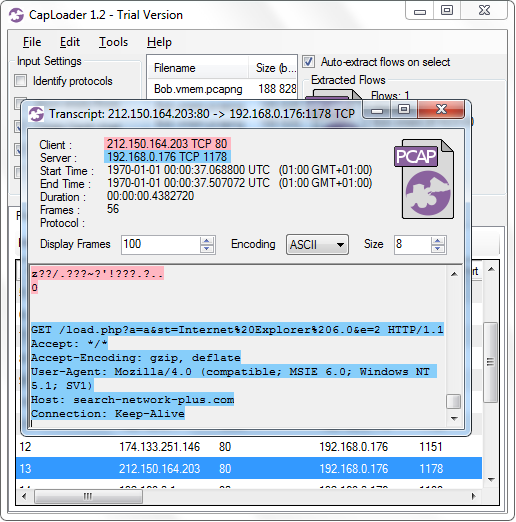 The analysis provided here is therefore based on the other five pcap files provided by Contagio. Notice how the flows to TCP ports 80, 9101 and 443 are classified as Tor? The statistical method for protocol detection in CapLoader is so effective that CapLoader actually ignores port numbers altogether when identifying the protocol. 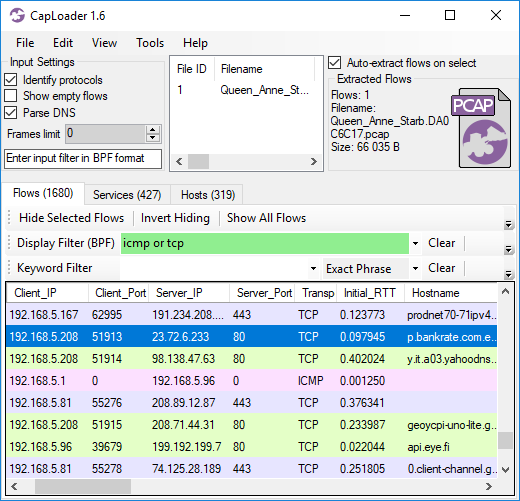 The speed with which CapLoader parses PCAP files also enables analysis of very large capture files. 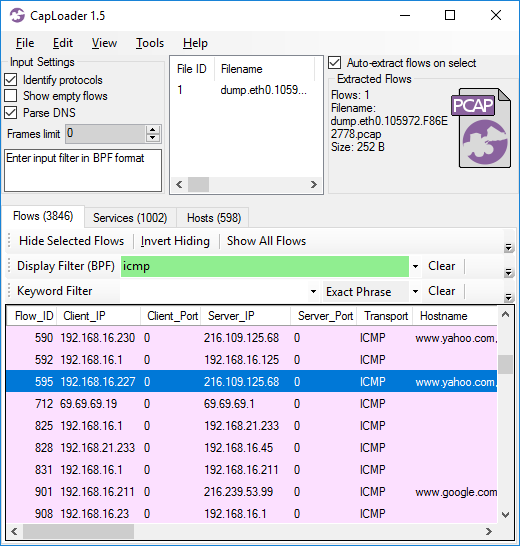 A simple way to detect Tor traffic in large volumes of network traffic is therefore to load a capture file into CapLoader (with “Identify protocols” activated), sort the flows on the “Sub_Protocol” column, and scroll down to the flows classified as Tor protocol. Most companies and organizations allow traffic on TCP 443 to pass through their firewalls without content inspection. The privacy provided by Tor additionally makes it easy for a botnet herder to control infected machines without risking his identity to be revealed. These two factors make Tor a perfect fit for hackers and online criminals who need to control infected machines remotely. Incident responders will therefore need to learn how to detect Tor traffic in their networks, not just in order to deal with insiders or rogue users, but also in order to counter malware using it as part of their command-and-control infrastructure. However, as I've shown in this blog post, telling Tor apart from normal SSL traffic is difficult. 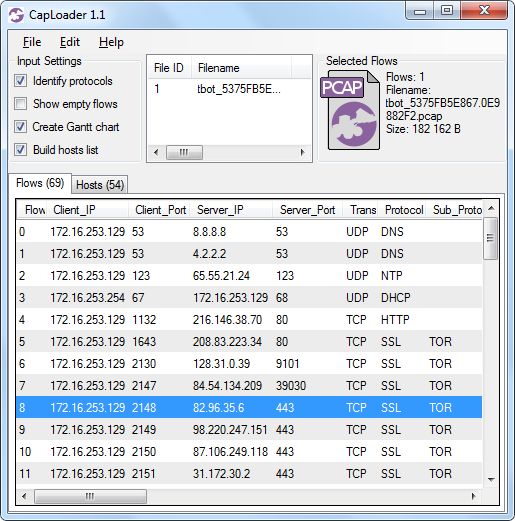 But making use of statistical protocol detection, such as the Port Independent Protocol Identification (PIPI) feature provided with CapLoader, is in fact an effective method to detect Tor traffic in your networks.